She was known as the "Dog Woman." Her name is Ingeburg Erika Schulz. She was a young-looking 73 when I knew her; a bright, articulate and outspoken woman who believed she was the victim of a conspiracy by uncaring neighbors and a certain police officer who launched a personal vendetta against her. That vendetta, or perhaps the insistence by authorities to force a nonconforming eccentric woman like Schulz to "follow the law" no matter what her circumstances, succeed in destroying Ingeburg's life and making her a ward of the state. She has been forced out of the house she bought and paid for because the Michigan Health Department said it is unfit for her to live in. The local animal control officer removed and destroyed her dogs because he said she violated the county's animal laws . . . she had too many unlicensed dogs and didn't have a kennel license. "They came into my home on Aug. 15 and killed my dogs. They made me watch. They tortured and harassed me as a senior citizen. Now they have locked me out of my house and made me homeless," she said. The officers who raided the home said they found Schulz living in squalor with 53 sick, malnourished dogs. They said the house had no bathroom facilities, and reeked of animal and possibly even human urine and feces that covered the floor and walls. The two-story brick house also was filled with fleas and rats that were feeding on stacked plastic bags of garbage and animal waste. Schulz, who appears as a clean, well educated and energetic woman, says the police are lying about the condition of her home. She admits, however, that she kept a lot of dogs there. And she admits that because she could not afford the $60 monthly cost of disposing of her garbage, that she stacked it all, with the animal waste, neatly in plastic bags. She argues that the smell of dog manure is not as poisonous as the exposure she was receiving from sprayed farm chemicals in the fields surrounding her Michigan home. She said the smell was no more offensive to her than the smell of cow manure spread in the fields right up to her property line. True, her situation was deplorable. Even Schulz admits that. "I lived in extreme poverty in that house for 27 years," she said. "But I was happy." She made the best of a very bad situation. Schulz is the daughter of a German judge who died after he was pressed into service in Hitler's army late in World War II. He was gunned down by allied forces in the Normandy Invasion when she was still a young girl. The war also cut Ingeburg's formal education short. She had one year of training in business school, however, and used her knowledge to become a restaurant manager. She came to the United States after meeting and marrying an American serviceman stationed in Germany in 1967. The marriage proved to be a disaster for Schulz, however. "He brought me to Michigan, then dropped me off like a dog and ran off with another woman. I never saw him again." Schulz survived on welfare and government assistance. She somehow managed to buy her house after arranging a land contract agreement with the former owner. And even though she was forced to live on a mere $42 every two weeks, the amount she could muster at first through welfare and social service, she succeeded in paying off the contract, paid her taxes, and somehow eked a living. That amount has since increased to $500 a month. The house was in poor condition when Schulz bought it, but she said she didn't care. "It was better than homeless," she said. She discovered, however, that there was no working septic system and she was forced to use an out-house as a bathroom. There was a well, but the plumbing had been frozen, all of the fixtures ruined, and even the pipe leading from the well to the house cracked. Old refrigerators, water heaters, and other appliances cluttered the place. Schulz didn't have the strength to move them out, or a place to put them, so she lived around them. She said she couldn't afford to fix anything, so lived in the house in the condition it was in for 27 years. For a while she carried water from a neighbor's house. A friend later paid to get the water line to the house replaced, and life got a little better. When the property was paid off in about 1994, Schulz said her next project was to have a new gas furnace installed. "A social worker came in once and said the government would pay to fix up my house. They told me they would install a bathroom and shower. They had a list of things that I needed. I waited two or three months and nothing happened," Schulz said. "Then they said they didn't have any money." Schulz said the dogs were all strays that came to her, or were dropped off by people who found out that she would take care of them. "In those 27 years I helped those dogs survive. I always put them first. They were my children the way I saw it. I did it for love. I helped every dog that needed help. I spent half of my check on them. 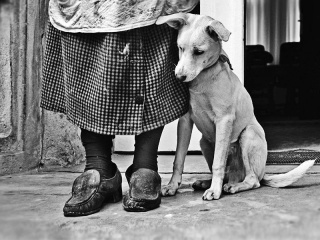 My house was a sanctuary for homeless animals." "Those shelters for dogs are not shelters. They only keep dogs and cats for a few days. If they don't find a home for them they are put to death. I don't call them shelters. I call them killing stations." Schulz said she knew about state laws requiring dog licensing and rabies vaccinations, and she made an attempt to comply. She didn't have the money to pay for the shots for all of the dogs (she had 53 when they were seized on Aug. 15). "I asked (the local animal control officer) to help me. He said he would be out to talk to me about it. He never showed up." She said a friend offered to pay for the dog licenses if she could get the shots. She also attempted to work with the county and buy a kennel license that would have cost her only $30, but her efforts were ignored. She said she loved her home among the trees and the dogs. "I lived for the house, the dogs, the trees and all of the birds that lived in the trees." Schulz was described by neighbors as a strange person who lived alone and had an unconventional life style. "I didn't have men over, I walked because I didn't have a car, and I had my dogs. They called me the dog woman and said I was crazy." Some even thought she might be a witch. Consequently, Schulz said she had conflicts with neighbors. The problem intensified after a small house adjacent to her property became rental property, and some of the occupants started doing things to make her life unbearable. "They shot guns, they burned trash, played loud music, called me names, and called the police to complain about my dogs," she said. Schulz said she was arrested and charged in 1999 for having dogs at large, when she was innocent. "They were a neighbor's dogs, but nobody would believe me." When authorities raided her home in August, 2003, they removed 53 dogs that were all destroyed. They also took Schulz by force to a nearby mental hospital where she was evaluated. The doctors there refused to declare her insane. When this writer talked to her, Schulz was staying at the home of a friend. She was still denied access to her personal belongings on the property that she owned. And authorities said they were planning to have the house demolished. The cost of the demolition would be assessed against the property, the prosecutor explained. What that means is that Schulz would have the little piece of land she worked so hard to pay for taken away from her. Because of social conditions at this time, there is no government agency in any position to help Schulz find or live in another home. In other words, she is forced by law to join the growing ranks of America's thousands of homeless families. Her crime: She was too poor to comply with man-made rules. And she loved the animals that came to her door too much to allow them to be destroyed.